Simon & Schuster, 9780743254618, 256pp. With all the talk of failing schools these days, we often forget that schools can fail their brightest students too. Gifted children forced into a "one size fits all" approach to schooling find themselves bored or frustrated, which can lead to underachievement, behavioral problems, or depression. Without sufficient challenges and resources, say Jan and Bob Davidson, America's brightest young minds languish, never reaching their full potential. Society can't afford that loss. In Genius Denied, the Davidsons -- founders of a nonprofit institute that provides assistance to gifted children -- offer hope and practical advice to parents and students alike. Through their own experiences and those of the families they've worked with, the Davidsons show parents how to find an appropriate education for their children, when to go outside the school system, and how to create a support network with school authorities and other parents. 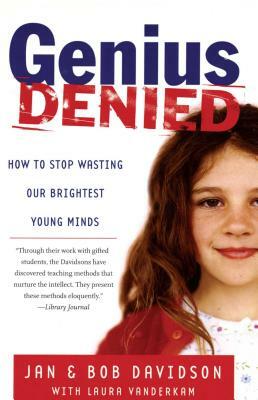 Genius Denied shows that with commitment and creativity, gifted students can get the education they deserve, one that nurtures their talents and minds. Talent Development, which provides financial and other assistance to gifted children. They live in Incline Village, Nevada. Laura Vanderkam is a contributing editor at Reader's Digest and is the coauthor of Genius Denied: How to Stop Wasting Our Brightest Young Minds. She lives with her husband in New York City. "I absolutely recommend this book." "Through their work with gifted students, the Davidsons have discovered teaching methods that nurture the intellect. They present these methods eloquently." "A handbook for parents who want to be general contractors of their gifted child's education, whether in the system or out." "An absorbing look at how our nation is neglecting children of exceptional intelligence."